No man or woman is an island, and the bigger your business becomes, the more it will rely on the collaborative efforts with other groups of people. From delegating important tasks to employees to working with quality vendors to building trusting relationships with investors, ensuring positive and successful professional commitments is necessary in order for your business to thrive. 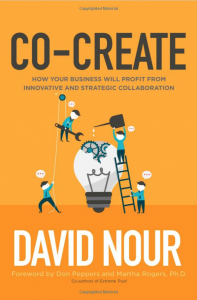 Joining us today to discuss this further is David Nour, business strategy consultant, and author of 10 books including his most recent one Co-Create: How Your Business Will Profit from Innovative and Strategic Collaboration. David began his journey first in Iran and then emigrated to the United States in 1981 with a suitcase and $100. He didn’t know anyone in American, nor could he speak any English at all. In the part of the world that David comes from, it is customary to have personal relationships first from which you do business. That is not typically the case in the U.S. As Americans, we are so focused on the business transaction that a personal relationship on follows if the transaction went well. So, how do we connect the dots between those relationships that know us, like us, and trust us, with the ones we need to accelerate our ability to get things done? Time has the same value as money. If a project can be completed faster, it adds value to your business. These kinds of contacts can actually accelerate your ability to get things done. While most people have an abundance of personal and functional relationships, a lot of people miss out on strategic relationships. The relationships that elevate your level of thinking to new heights. If you really think about relationships as an investment, you can learn how to become more intentional in the people that you choose. Previous articleWhat Types of Insurance are Best for Your Small Business?